Scarecrow was just nominated for a 2015 Stranger Genius Award! They threw a secret taco party for us and everything! Then they wrote this lovely article about us. 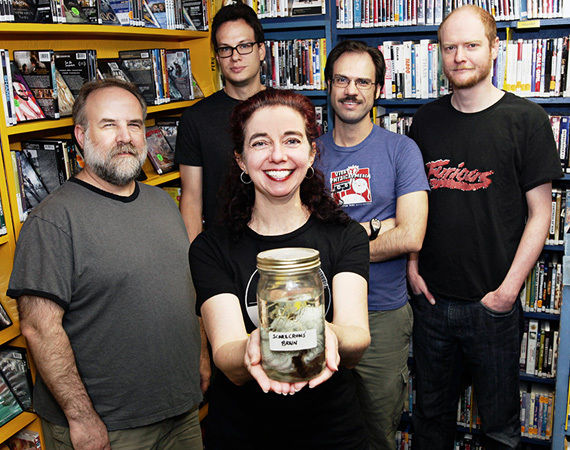 Here’s a great piece on just how vital video stores are to film culture and how stores are surviving in the digital climate. 26 Hard-To-Find Movies That Remind Us Why VHS, DVD, And LaserDisc Still Matter, a great piece from Buzzfeed about a bunch of rare titles you can only find at a video store. Below you’ll find a rundown of ALL the great stuff folks have written about us lately. An episode of KCRW’s “The Business” that featured us. The original Seattle Times piece marking our launch. A great piece at Huffington Post. We even got some awesome tweets from Elijah Wood (who also contributed…Thanks Elijah! ),Eli Roth and Kurt Loder! and finally, from KUOW, How Scarecrow Video is Like a Kung-Fu Movie!